Friends interested digital voltmeter circuit very much. But cannot buy ICs since it is very ancient. Figure 1 is 0-50V scale. Display with LED 7 segment. In cost 3$ dollar only. Figure 2 is wires connector or terminal by white is power supply of 9volts DC or AC and Input wires is a black as negative(-) and the next one a Red wire as positive (+). on 0-50V range full scale. So fixed to most my working. But it uses 9volts we should reduce voltage down to it. Figure 3 Many DC adapter is used as power source. I will remove it then modify circuit as Figure 5 instead of them. Figure 5 All parts to modify as 9-volts DC regulators. 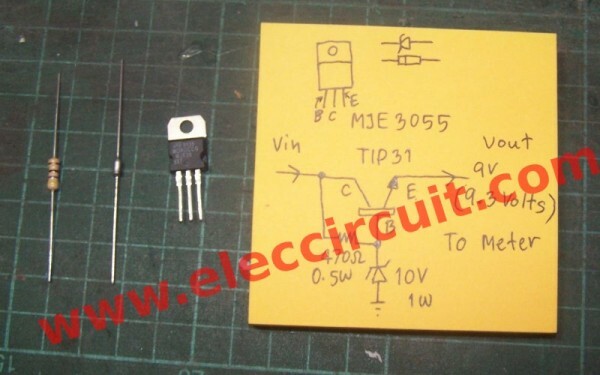 Which have one transistor MJE3055 or TIP41 or TIP31 is NPN transistor 2A 40V. Next one is 10V Zener 1watts that is used as 10-volts steady voltage. And 470 ohms resistor to bias current to Zener and base of the transistor for high current output. Which this meter use current about lower than 100mA only. As Figure 6 The compare between the transistor regulators set is modified, which take them to replace the IC-7812. Figure 7 I found the electrolytic capacitor blob or not good for used in future. I change it with 1000uF 35V is higher voltage than old one. Figure 8 The 9-volts DC adapter adapted successfully. Video: Testing, it is very accuracy. Compared with digital multimeter. I measure a voltage of 9-volts battery results is 8.3V same them. If we have a 3 wires LED digital voltmeter panel. Here is its Back. We are looking at the 3 wires, red, black, yellow. The wiring of 3 wires in a LED voltmeter. We need to use the external DC power supply to them, 3V to 30V. In this case, I use a 9V power supply and it should be a fixed regulator. Next PostDIY AC 220V Power Strip for my electronic work bench. The IC Chips CA-3161(2) are Available on E/BAY.They are Expensive but still exist!!!! Thank a lot for your feedback. Now I cannot buy CA3161IC. how to i make 9v 1A dc from 9v 1A transformer?